...is get elected. That's it. It's the only thing they have to do well, really, to have their jobs. Name one other thing President Obama is good at? 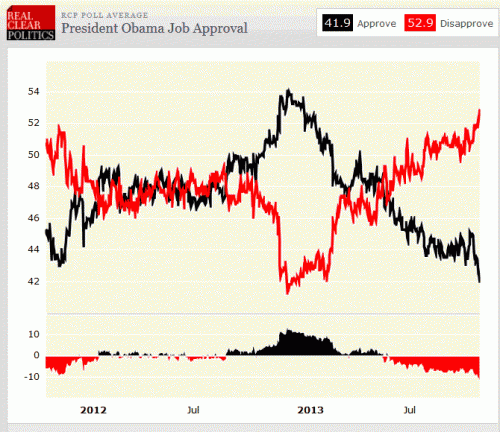 Here are Obama's polling numbers over the last couple of years (approve is black, disapprove is red). Note the fair to middling muddled approval rating for most of the period. The numbers never crack 50 ... EXCEPT for the days leading up to the last Presidential election, and then he managed put in place a full court press to get his popularity up just high enough and just long enough to get elected. Host Gator usually does a good job for me but screwed up bringing the server back from maintenance. To their credit they admitted the mistake. All looks well EXCEPT for some reason we have picked up absurdly high Disqus Twitter reaction counts.